Find out where Eddie will show his ugly mug when Iron Maiden’s going exotic. 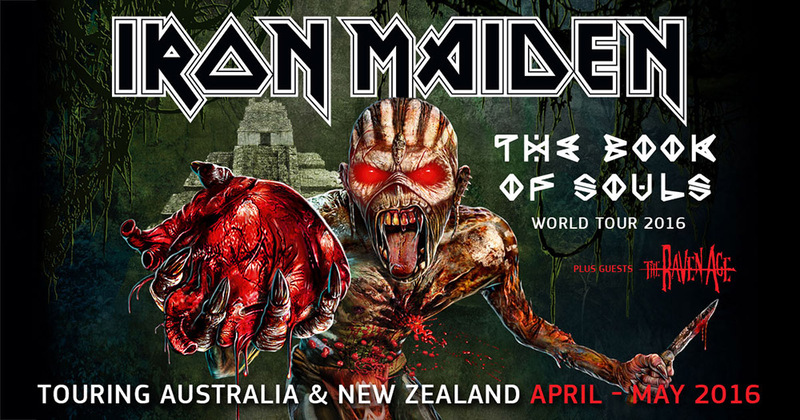 Iron Maiden is heading to New Zealand for the first time since 2009 and will visit Australia for the first time since 2011. The setup is similar to the 2008 Somewhere Back in Time Tour, with the addition of Adelaide. When they played the same venues in Sydney and Melbourne in 2008, they ended up with double dates in both cities. Two dates in South Africa is also on the routing. This will mark Bruce Dickinson‘s first visit to South Africa with Iron Maiden. “We cannot wait to get back out on tour. When we start in the USA in late February it will be 19 months since our last show at Sonisphere in the UK so we are raring to go. Maiden thrive on touring and getting out to our fans, it’s what we do best, so it will be a great feeling to board our new Jumbo Ed Force One with the crew and the gear and head round the globe and get back on stage for you guys. We haven’t played in Australia and New Zealand for a number of years so it will be a pleasure to play for our Antipodean cousins again, irrespective of who wins the dates with destiny at Twickenham in a few weeks’ time! !